following some suggestions on func_msgboard,i’ve added a few things to the compiler gui program. -Added some error checking to recover in the case of corrupted config.ini. It still requires you to restart the program though. -Added ‘factory defaults’ in the case of a deleted config.ini. It still requires you to restart. -Checking ‘Run Quake’ or running quake manually will automatically apply +map mapname, you still need to enter -game mod in the arguments though. -Changed main window to allow it to be minimized. no real mapping to report today, i was helping a friend of mine install some wiring in his house. i do have the original story behind ne_cath. actually, the story was lost, along with all the other data, but i wanted to have it down somewhere, so i’m re-writing from memory. this is probably a better method of showing new areas vs old ones. here’s the current version of the canyon now. it’s got some kind of castleish thing down on the bottom right which gives access to some lifts that bring the player up high enough to reach the ledges that lead back up north. the giant grassy area on the right has no purpose atm. i want to use it to just connect some areas a bit more just to open the map up a bit. 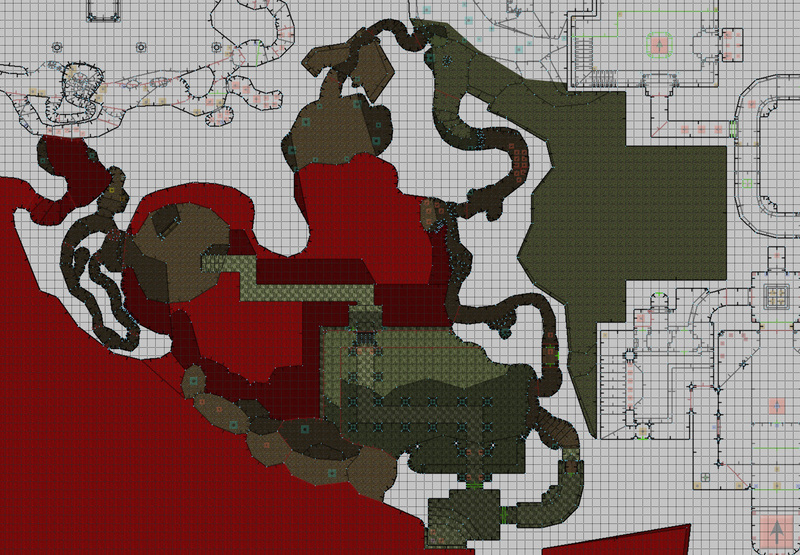 i may spawn a ton of monsters here and having the opening will allow them to spill out into other areas better… but i’m not really sure. i may just leave it as decoration or something. i’ve been playing some riven recently thanks to a mod that allows it to run on my macbook pro and a thought that used to occur to me often back when i was first playing it came to mind again. this would be so much cooler if it was realtime. i got to thinking about the gameplay mechanics in riven and what kind of puzzles there were and i realized that it could be done with doom3. i mean, there’s the obvious problem of only having access to hard shadows, but aside from that, the engine provides enough flexibility to accommodate all the puzzles in riven. the fancy rides between islands (maglevs and the mine cart) are simple to create with splines and any anything else like machinery can either be scripted directly in the engine or else animated in md5 files. riven never requires you to swim (indeed, water is actually a barrier) so the lack of liquids in doom3 is not an obstacle. and then, i got started thinking about the art assets. even if all the sounds from the game were ripped, it would still leave a colossal number of models and textures. it would just not be possible to make it all. doh. was supposed to finish off the cavern by building the button area that enables the gateway in the center to be used by the (A), but mapper’s block happened so i dropped it for now. instead, i started on the outdoor canyon area (B). i had to rework this area before i finally settled on what’s there. the first time, i had some problems integrating the new area with the first outdoor section above it. that first area had a ceiling height of 128 but with the sky at 0, so anything had to be below 0 which the original area wasn’t. (i wanted to create a mountain above the ground height). i settled on making nominal ground height far above sea level, so when the player appears at point (B), they are actually about -1024 down. as they work across the canyon (following the red line, roughly), they eventually come back to 0 height. i added a tower (C) out in the ocean to act as a sort of landmark for the two ‘windows’ i added through the rock walls shown by (D). 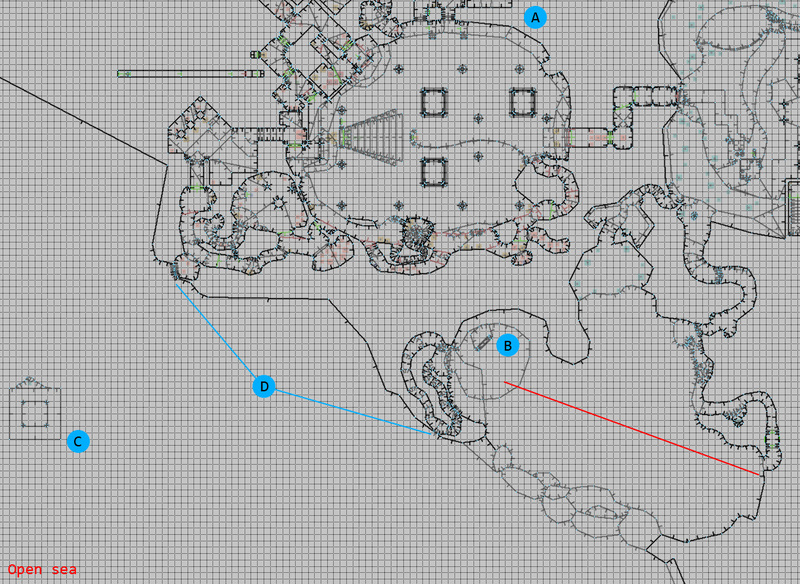 this will give the player something to place themselves with (without having to look at the map).